GEEK OUT! THIS IS AWESOME! It is great to be in a time when it’s fashionable to admit to being a geek. In my youth I often tried to hide the fact that I was ‘into’ geeky things, but the geeks have taken charge (thanks Steve Jobs and Bill Gates) and we can cop to our geeky passions. Being a product of the 1960’s, I grew up with some pretty awesome television programming. TV was my babysitter (as it was for many latch-key kids). And if television was a babysitter, Hanna-Barbera was the sitter I most relied on to keep me entertained. Future Quest takes many of Hanna-Barbera’s finest sci-fi/adventure characters and brings them together in one series under a very believable (given sci-fi storytelling) plot. Essentially – a rift in the space/time/alternate universe continuum threatens multiple worlds and is bringing a wide variety of creatures and heroes to Earth. Dr. Benton Quest is on the case, but so is the evil Dr. Zin, who is hoping to tap into the power for his own nefarious purposes. If there’s a heroic character more attuned to the teenage boy than Jonny Quest, I’d love to know who it is. Centering the story around the Quest family is ideal and will hopefully bring new, young readers to the graphic novel format and should appeal to we older folk who can renew our early geek days as Jonny Quest followers. My other favorite from the Hanna-Barbera canon is The Impossibles. Most people don’t remember them, but they had a mighty impact on the pre-pubescent me so to see them again was a real thrill. Author/creator Jeff Parker has clearly done his homework on all these H-B characters and has managed to give us an origin story for them – origins that were pretty opaque prior to this. Although the story-line for The Impossibles did not fit as clearly in the over-arcing story as some of the others, it was still very enjoyable and fun to learn of an origin for their abilities (and the addition of the new member is quite welcomed). We jump right into the book with a whole lotta action and a ton of questions. The action eases up only for the necessary background information to be delivered and the occasional origin story, but Parker does a great job to deliver all of this fairly seamlessly so that it doesn’t feel like a massive interruption in the narrative. He is clearly familiar with the comic-book/graphic novel format and works well within it. The art by Evan Shaner, Steve Rude, Ron Randall, and Craig Rousseau is quite good. It captures the essence of the 1960’s television characters to which so many of us are familiar, but steps it up to a slightly more realistic look. Reading through this book, my excitement level was on high and I really felt like a kid again. This is just an all-around wonderful graphic novel. The story is incomplete here, which I don’t mind in the comic/graphic novel format. In fact I’m hoping that this series never ends because I want to keep living in this pure, adolescent joy for as long as possible. Looking for a good book? 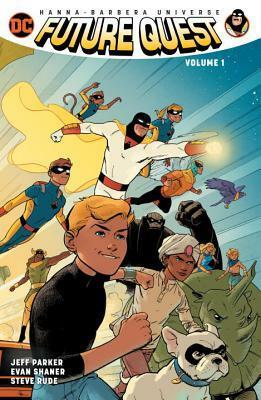 The graphic novel Future Quest brings together many of the wonderful Hanna-Barbera cartoon heroes into one universe to fight off a common foe. It is an exciting story, well-told and drawn and will appeal to the new reader as well as to those who remember when these heroes first graced the airwaves.